Trump's National Security Advisor laments 'wretched' Iran nuclear deal in talks with Netanyahu, says US will block Iranian nuclear weapon. 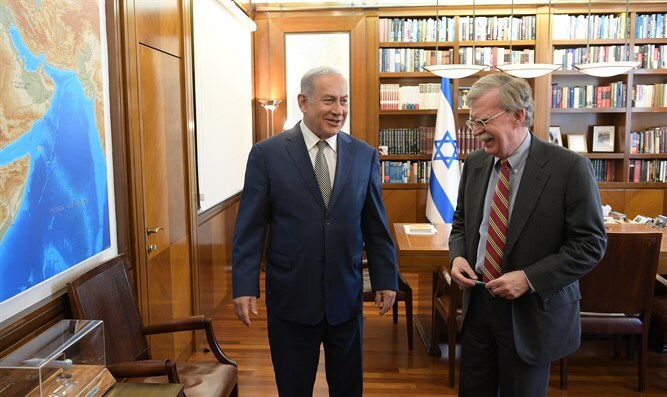 Israeli Prime Minister Binyamin Netanyahu met with President Donald Trump’s National Security Advisor, John Bolton, in the Prime Minister’s Office Monday morning, a day after Bolton arrived in Israel. During the talks, Bolton lamented the “wretched” 2015 Joint Comprehensive Plan of Action, better known as the Iran nuclear deal. Prime Minister Netanyahu expressed his agreement, calling the deal “disastrous” and “terrible”. The National Security Advisor also told Netanyahu that the Trump administration views preventing Iran from acquiring a nuclear weapon as a matter of the “highest importance”. “It is a question of the highest importance for the United States that Iran never get a deliverable nuclear weapons capability,” Bolton told Netanyahu at a press conference Monday. Bolton also told the Israeli premier that the White House is exerting pressure on key European allies to drop their support for the 2015 Iran nuclear deal. Trump’s advisor added that the White House was similarly concerned with Iran’s efforts to bankroll Islamic terrorism around the world. Netanyahu praised Bolton and President Donald Trump, and said that the administration had strengthened the US-Israel relationship. "As I mentioned last night, we have known each other for many decades, and you have been a consistent champion of our alliance in and out of government. It is a wonderful alliance, and Israel believes that it has no greater friend and ally than the United States. I believe that the United States has no greater friend and ally than Israel. It is a peculiar kind of ally: we have consistently increased out defense spending, we insist on defending ourselves by ourselves, and appreciate all manner of American support." "Under President Trump that alliance has grown stronger than it has ever been." The two also met for dinner Sunday night, shortly after Bolton’s arrival in Israel. The meeting was also attended by US Ambassador to Israel David Friedman and Israeli Ambassador to the United States Ron Dermer. "It’s a great honor to be here,” Bolton responded. “It’s great to see you again and talk about the US-Israel relationship. The two are expected to hold a series of meetings over the next three days, with a primary focus on Iran’s nuclear aspirations and US sanctions on Tehran. Bolton is also expected to discuss efforts by the US and Israel to secure the removal of all Iranian forces from Syria, and interim solutions for the Gaza Strip. "Your visit here gives us the opportunity... to align our policies even more closely, on Iran, on Syria, on Gaza, and on the many challenges that face both our countries in this region,” Netanyahu said Monday.